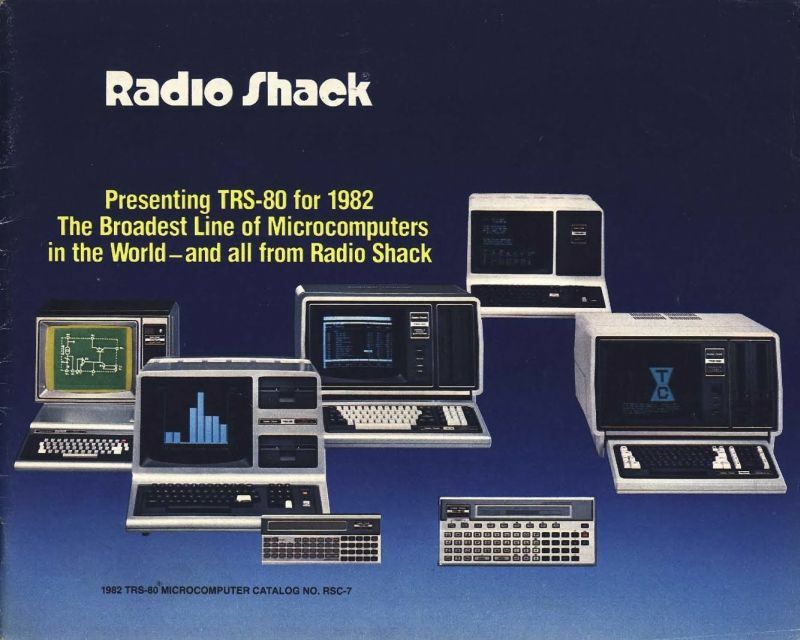 Today, August 3rd, is the 41st anniversary of the release of the Tandy / Radio Shack TRS-80 personal computer, originally released back in 1977 (Tandy was a leather company of all things, and bought out Radio Shack WAY back in 1962 – TRS is an acronym for Tandy Radio Shack). I have a personal place in my heart for this particular machine, the Model III specifically which is shown in the header image, but the whole line, which included pocket-sized, handhelds, portables, luggables, and multiple desktop models over the years, is easily one of my favorites. 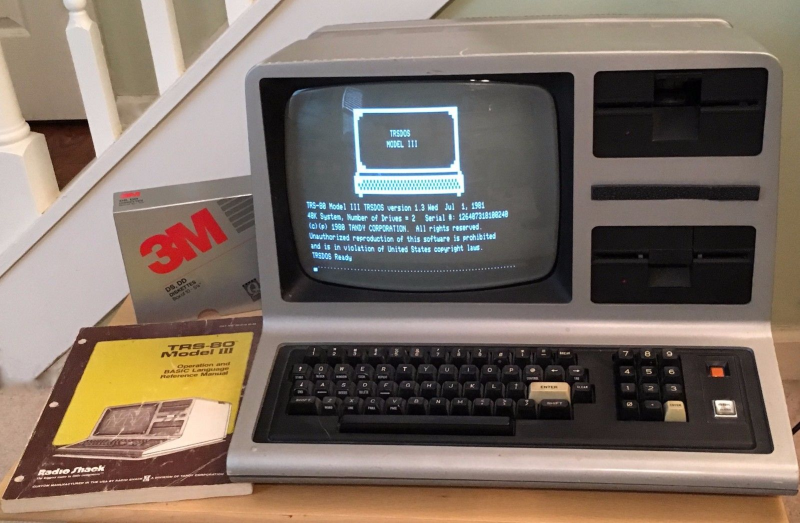 You see, there is a trinity of devices and systems in the history of computing that just give me chills when I think about them, and along with the Commodore PET and Apple IIe, the TRS-80 is one of them. Although it wasn’t the first true PC I ever used – that would be the PET – it was the first on which I had significant exposure to what a machine could do. It was the machine of choice for a computer summer camp – don’t judge! – that I attended while but a wee lad. Using cassette tape as magnetic storage via an external cassette player often also bought at Radio Shack, we learned about computers and programming and wrote programs in line-number BASIC. They weren’t terribly sophisticated, but even at that young age, I managed to write a text-based adventure game in which you explored a haunted house solving what I thought were pretty well-thought out puzzles: I was most proud of the skeleton who was willing to help you, but only if you retrieved his missing golden-ringed femur which had been stolen by a dog – a golden retriever. I’m STILL proud of that one. Even though it was colloquially referred to back then as the “Trash-80,” showing that system wars have existed for far longer than anyone would imagine, it was a surprisingly robust machine. Being the pre-GUI era, and even the pre-OS era, like the PET it came only with BASIC pre-loaded; there was no true operating system. An attempt was made to address that with the later release of TRS-DOS, although even that wasn’t a true operating system; it was merely a limited expansion of the capabilities of BASIC. The most efficient thing to do if you wanted to run programs was to buy them on cassette and load them into memory via the play button on a standard cassette player. If you wanted to save a program you wrote, you’d use the record function, but be sure to skip past the leader tape (a mistake I made once and never again). Oh, did I mention that much of the system code for the TRS-80 was written by Bill Gates? It’s true! In fact, here’s a neat side-by-side of Bill Gates and Microsoft co-founder Paul Allen in 2013, recreating a famous photo originally taken in 1981, in which they are surrounded by, among other things, an Apple, Commodore Pet, and TRS-80! These images were taken from a Forbes article about the event that’s interesting reading. Versions of the TRS-80 were released and in operation up until around 1991, which is a pretty good lifespan for a PC line, especially one that was never considered much competition for the other powerhouse lines from Commodore, with the C64 still being the most successful personal computer ever made, or Apple, a company that’s still so successful it just became the first to have a trillion-dollar valuation. Meanwhile Radio Shack, a chain that could at one time claim 95% of the US population lived within three miles of one of its stores, sadly closed down permanently in 2017. Even so, the time in my life it represents, the sheer force of discovery it provided, the capabilities it displayed, the potential it showed, the experiences it allowed, even now as I get older it provides an incredible rush of nostalgia and reminds me of the excitement I felt for technology as it was a new and exciting thing in the consumer space. I don’t feel it so much these days, but at least there’s something that provides such a reminder. I am also happy to announce that there is a fully-functioning Windows-based TRS-80 emulator, Sharp-80. It works amazingly well and shows exactly what kind of interfaces and accessibility we had to work with back then. Be warned: It’s fun to use and of course I’ve spent a long time with it reminiscing about the bad old days, but it’s also not for the faint of heart, and if you’ve been raised in the coddled, cushioned world of GUIs, you’ll be in for a shock. A wonderful, text-based shock. Happy birthday TRS-80, and thanks for everything. I’ll always remember.